Croup is a common children's ailment that occurs when swelling develops around the trachea and vocal chords. One of the most noticeable symptoms of croup is the loud, harsh barking sound that occurs when your child coughs or attempts to breathe normally. While it may be safe for children with mild cases of croup to swim in shallow areas, more serious cases can pose dangers due to narrowing of the windpipe. For best results, get a pediatrician's approval before letting your child swim with croup. According to MedlinePlus, viruses such as parainfluenza account for up to 75 percent of croup cases. Commonly occurring in children between the ages of 3 months and 5 years old, croup is an inflammatory condition that swells the area around the larynx and trachea. As air passes through the narrowed windpipe, the vocal chords begin to vibrate, creating the harsh barking noise that accompanies croup. Although most cases can be cured at home with the use of a dehumidifier and proper hydration, severe cases can lead to a lethal bacterial superinfection called epiglottitis. If your child is breathing easily and feeling relatively comfortable, it may be safe to let him swim in the shallow area of a swimming pool. Try to limit his time spent underwater, and provide a snorkel to help him breathe at all times. The Pathlights website recommends avoiding sudden temperature changes that may agitate inflammation or cause restriction in the windpipe. That means no diving or swimming in areas where the water is either very hot or very cold. 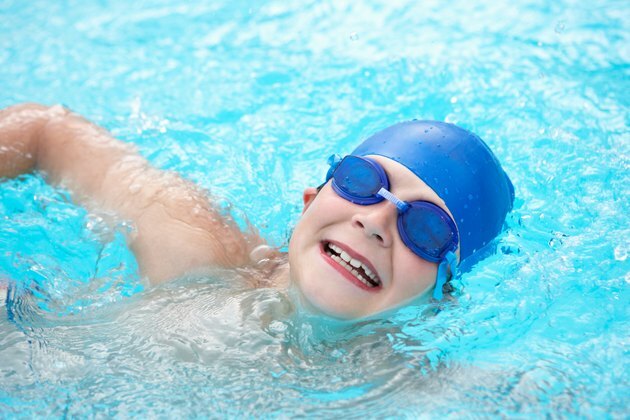 If your child is having difficulty breathing, it may be better to avoid swimming for other aerobic activities, such as walking or jogging. Reduce the shock of temperature change by having your child gradually step into the water using the stairs at the shallow end. If possible, swim with your child so that you know where he is at all times and can help him if necessary. Ask your child to remain in the shallow end and keep his head above water at all times unless using a snorkel. If your child appears to have difficulty breathing or accidentally breathes in water, quickly help him out of the pool. Never let a child with croup swim unattended. Even if it appears that his symptoms are mild, temperature changes and other events can cause the trachea to tighten, making it hard to breathe. Always get approval from your child's pediatrician before allowing him to swim or perform intensive exercise with croup.